Darkness falls on Richard B. Riddick once again in The Chronicles of Riddick: Assault on Dark Athena. Originally planned as a simple current-generation remake of 2004's The Chronicles of Riddick: Escape from Butcher Bay, developer Starbreeze changed course during development, creating a whole new chapter in the story of Vin Diesel's Riddick character. Upon escaping from the Butcher Bay prison in the first game, Riddick and his "captor" Johns are torn out of space by the Dark Athena, a massive spaceship inhabited by former mercenaries turned interstellar pirates. It's up to the predatory anti-hero to make his way through the bowels of the ship to escape the ruthless female captain who wants him dead. Escape from Butcher Bay is widely considered to be one of the best movie tie-in video games of all time. Has Starbreeze managed to stay the course, or is it lights out for the Riddick franchise? Escaping Butcher Bay: Everything that made the original release of The Chronicles of Riddick: Escape from Butcher Bay an amazing experience returns, with the addition of new content that was previously only available in the PC version. Starbreeze nailed just about every aspect of the Riddick universe in Butcher Bay, from the cramped, oppressive atmosphere to the colorful characters inhabiting the facility. The prison is as much of a character as Riddick himself; a living, breathing organism that the protagonist is going to hurt a great deal before making his ultimate exit. Hand-To-Hand: No game handles first-person combat with quite the proficiency that The Chronicles of Riddick does. Where other games featuring hand-to-hand combat leave me longing for a firearm of some sort within the first few battles, Riddick's close combat had me completely ignoring the guns in my inventory until they were absolutely necessary. It just feels right. Richard B. Riddick: Why is the character of Riddick so enjoyable to play? An exchange between the Diesel-powered killing machine and a prison inmate in the Butcher Bay section of the game sums it up nicely. The other prisoner explains that what really bothers him about Riddick is that he seems so comfortable in any situation, even locked up in the galaxy's most secure prison. Riddick replies, "I just take the hand life deals me. Then I cheat." He's controlling his destiny, and you're controlling him. Pitch Black Multiplayer: While most of the multiplayer modes in Dark Athena don't offer anything new, the Pitch Black mode is one of the most entertaining times I've had killing other people over the internet. At the start of each round, one player is Riddick, and the others are mercenaries, hunting him in complete darkness with nothing but the light from their weapon-mounted flashlights to see by. The stronger the weapon, the weaker the beam of light standing between you and certain death. The tension created by the situation is amazing, and playing Riddick himself gives players plenty of opportunities to toy with the competition. Voice Acting: The voice acting in both halves of the Riddick video game saga is superb, particularly in the exchanges between Riddick and the captain of the Dark Athena, Revas, voiced by actress Michelle Forbes. The dynamic between these two characters is one of the highlights of the new content - one of the main reasons to stick with the game despite its flaws. Gears of War fans might also want to keep an ear out for John Di Maggio's stint as various guard voices in Butcher Bay, where he sounds an awful lot like Marcus Fenix. Assaulting Dark Athena: The Dark Athena portion of the game is larger, prettier, and completely misses the mark as far as providing a satisfying Riddick experience goes. While stealth and hand-to-hand combat are a large part of the early portions of the game, it eventually morphs into your average run-and-gun first-person shooter. Butcher Bay gives you long stretches of gameplay where wielding a gun isn't an option, while after a certain point in Dark Athena you find yourself heaped with weapons and a seemingly never-ending supply of ammo. The story fails on several fronts as well, with a major character in the franchise sleeping through the entire game, and an ending that's not much more than a snappy line of dialogue and the rolling of the credits. The Rest of Multiplayer: Assault on Dark Athena originally wasn't supposed to even have multiplayer, so I suppose getting any at all is a blessing, but with the exception of the aforementioned Pitch Black mode, the rest of the online offerings are pretty staid. It plays like a poor man's Unreal most of the time, right down to the cheesy announcer calling out "Double Kills" and "Murder Sprees". Murder spree? Backtracking: A problem in both the old game and the new game, far too often the player finds themselves running back and forth between the same couple of areas as they complete quests in order to move the story along. It wouldn't be such an annoyance if not for the painfully long load times. NPC A asks you to go to another area to ask NPC B a question, loading. Returning with the answer, loading. During one particularly late session with the game I actually fell asleep during a loading sequence, woken up by gunfire from a wall-mounted sentry drone upset that I hadn't moved. It's amazing how these two different games parallel the two live-action movies in the Riddick franchise. Like Pitch Black, Escape from Butcher Bay does innovative things on a relatively small budget, providing a unique, dark and gritty experience to the player. The second film, The Chronicles of Riddick, sought to capitalize on the success of the first by increasing the scope and adding tons of flashy special effects, but ultimately wound up an average science fiction film that just happened to feature one of the most compelling anti-heroes in the genre. That's exactly what Assault on Dark Athena does. It trades innovation and atmosphere for better graphics and production values, and while the genius of the original title shines through now and then, far too often you're simply running and gunning as you would in any plain vanilla first-person shooter. Still, I consider The Chronicles of Riddick: Assault on Dark Athena a worthy purchase, especially for those of you who never played the original game. While the fresh material might not deliver a compelling new experience, we'll always have Butcher Bay. 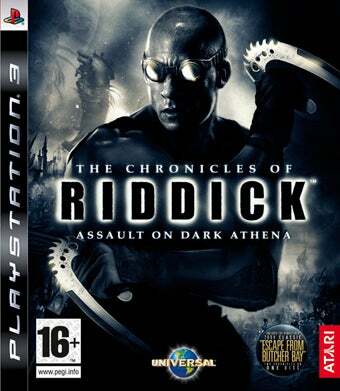 The Chronicles of Riddick: Assault on Dark Athena was developed by Starbreeze and published by Atari for the Xbox 360, PlayStation 3, and PC. Released on April 7th, 2009. Retails for $59.99. Played PS3 version. Completed both campaigns on standard difficulty and participated in multiple multiplayer matches.